Last September, physicists met to discuss a proposed National Underground Science Laboratory. Earth scientists were at the meeting too, making the case for a long-awaited underground earth science laboratory. To reduce truck traffic through the Alps, Switzerland is improving its rail system. Part of the project means building two tunnels under the mountains, one that will stretch 57 kilometers long. This year's career profiles go in-depth, featuring geologists who make caves and mines their workplaces. And, read our special careers page. 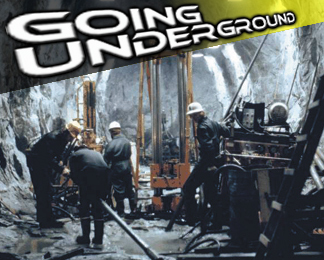 Any plan to build an underground laboratory will demand that geoscience and engineering merge. A look at the new leaders who will be making key decisions that affect earth sciences. Start small and grow: How to bring students and scientists together. A trip to the top of Mount Washington. Researchers move closer to giving communities notice of an approaching quake. Geologist Louise Hose rappels her way down to Lang Caves in the Grand Canyon. She is one of the earth scientists featured in this issue who make their workplace underground. Read the story online. Photo by Gary Stiles.